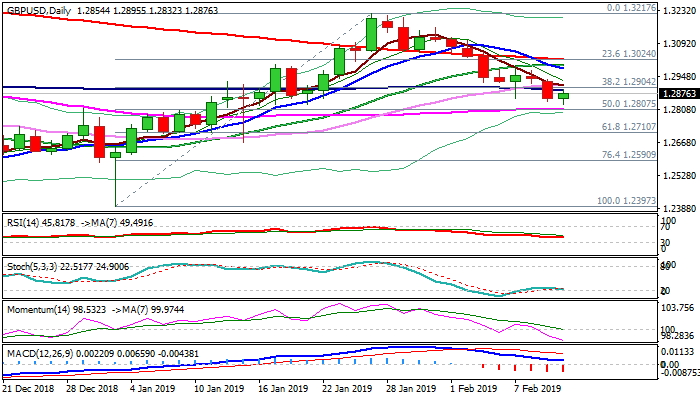 Recovery rally from new three-week low at 1.2832 that commenced in early European trading on Tuesday, showed signs of stall in early hours of American session, as broken 100SMA (1.2890) managed to cap corrective action. In my morning forecast I pointed at 100SMA as ideal cap for positioning ahead of fresh weakness, after strong bearish signal was generated on Monday’s close below significant 1.29 support zone. Repeated close below would re-confirm bearish stance for extension of bear-leg from 1.3217 (25 Jan high). Bears would look for test of solid supports at 1.2807 (55SMA / 50% of 1.2397/1.3217) and 1.2786 (daily cloud top). Momentum continues to trend lower in the negative territory, while stochastic turns south after brief recovery attempt from oversold territory, adding to negative signals. BoE’s governor Carney, in his speech today said that global economic growth is likely to stabilize, but at slower pace and pointed to negative consequences of no-deal Brexit, which could be likely scenario of divorce between the UK and EU, if solution won’t be found in coming weeks until the 29 Mar deadline.